Autumn is probably one of the most confusing seasons just in general but especially when it comes to dressing appropriately. We all know that when Winter rolls around, it comes time to rummage around in the nether regions of our closets and find long lost tights and boots. I think that I have Winter down, I also have Summer down and even Spring isn't too much of a problem. Autumn though...I mean what do you wear? Are jeans the only real option here or are tights okay? Should I wear a skirt with tights and boots or with boots but no tights? I find this season all too confusing for my liking and I'm always at a loss of what to wear. I would say that when I do search outfits on Pinterest or We Heart It, 99% of the time it's a hunt for Autumnal inspiration. Having said this, I have tried to get my ducks into at least the same pond this year and make a little Autumn look book. So, without further ado, here's part 1. This is definitely a 'warmer day' look. Perfect for a day that's somewhere between Summer and Winter. I have taken the staple of black jeans and paired then with a larger fit shirt (in this case from Mr Price) and some cool sandals. I really like this shirt because of the bit of ruffle detail on the back for visual interest (which you cannot see in this image...sorry) and the larger fit works really well to balance skinny jeans. I always feel like my hips are my largest part and so a flared or bigger fit shirt which lands on the hip really helps. I would say that the only real way to wear this shirt with flared jeans would be to tuck it in (ditto for a skirt). Absolutely one of my favs for warmer Autumn days. I'll show you this shirt with a skirt in the next instalment of the 'Autumn Look Book'. Once again, jeans make this look work. This time, the jeans are from Topshop (the Cain style if you were interested) and are a lovely high waisted fit. High waisted jeans are always a great option in my opinion. I'm not a huge lover of jeans (or pants in general) because I feel like they always make my legs look short and fat. Having a high waist really lengthens your legs and makes you look taller. Personally, I like a nice flat shoe with this look. You can really go for any shoe and you can even bring a pop of colour in with the shoe. I chose a pair from Rubi by Cotton On which are slip on and have a nice black and white print for a bit of interest. It isn't a big secret that denim goes with everything, even with denim [just make sure the denims are different enough in colour so you don't end up looking like the 90's threw up on you because that's not a good look on anyone. Here's looking at you Britney Spears and Justin Timberlake]. 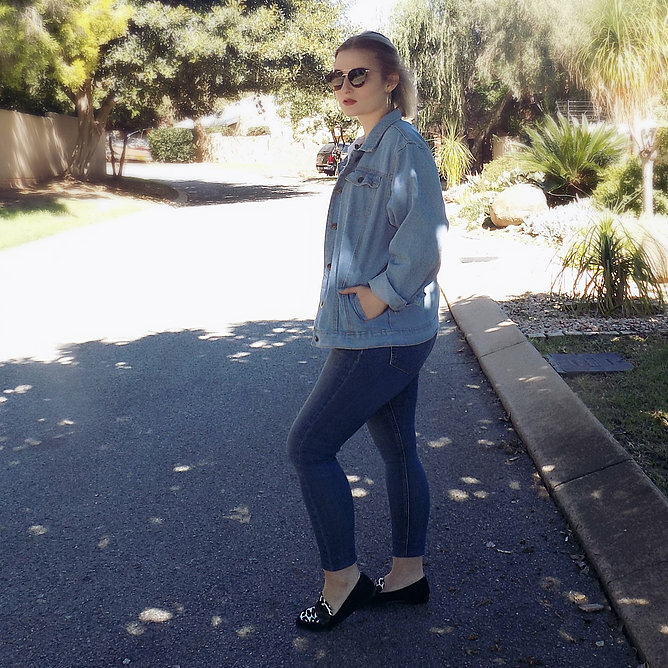 This particuar denim jacket is from Mr Price and is so comfy. It's very much 80's or 90's in style with is large fit sleeves and bulky look. I particularly like using all the pins (the 90's had them) to decorate the jacket and make it your own. You might have some from all over the world, some from your childhood (especially if you're a 90's kid) and maybe even some from Disney. However, if you find yourself sans pins to put on your jacket, worry not as places like Cotton On, Topshop and Typo are selling them. I love the customisation of clothes which has made a big return in 2016/17. Patches, badges...anything you want, go mad. This jacket already has a really cool back which is quite novel and very much a 'joburg' print. If you have a plain denim jacket and want it to look more 'you' just customise it either by sending it off to be printed on or by decorating it yourself if you're feeling artsy. Recently, I took my yearly trip with my parents to Umhlanga. I always loved Umhlanga but recently, my love for the place has grown exponentially as it has become more built up and buzzy (i'm a city girl). This outfit was what I wore the day we road-tripped back from Umhlanga to Johannesburg which is a 6 hour trip. It's a long time to be sitting in the car and thus you have to choose your clothes carefully. The first and most major thing to consider is the weather. In order to be comfortable both in and out of the car you need to make sure you know what the weather is all along the way at stops as well as at the final destination. It was a hot day reaching 30 odd degrees Celsius in both Umhlanga and Durban. However, the midway point where we stop for lunch (Harrismith) was only around 20 degrees. That's a big temperature difference. You also want to be comfortable enough to sit in the car, maybe lie down and sleep if you're that way inclined on long journeys. While you do that, you don't want to end up with extremely creased clothes when you exit the car. For me, style is very important and I always want to look good even when travelling. I specifically didn't want to wear jeans for this trip because of the temperature and i wasn't sure about how a dress would wear after a few hours of sitting in the car. So I decided against the wearing of a dress. Instead, this was the outfit that I chose. It is a bit of a step out of the box for me as (for unknown reasons) I have never worn these pants with anything other than a white t-shirt. I actually love the tee that I chose here so much though. It's from Mr Price and one of those really soft and easy-to-wear materials that just scream comfort as soon as you put them on your body. It is a pale pink and says 'Hollywood' across the front. The pants from Zara are absolutely one of the most comfortable and easy wearing thing you can put on your body. They slip on and off really easily (which is amazing for long car trips) and they're flowy enough to be comfortable and look super easy-going. They still have that pop and make a bit of a statement though. Essentially the 'pants' are actually long length culottes. The piece that I have tied on the side as a 'belt' is acyually the front bit of fabric that creates the 'skirt'. I tied it with a hair band and it works. I actually like these more worn as pants than as culottes. My sunnies are my prescription Ray-Bans and the shoes are a nice, comfortable and practical heel from River Island. The bag is vintage Louis Vuitton and I am in love with it. So yeah, that's my outfit. I will try to find similar pieces and link them for you below.